Come on a wine tasting adventure. 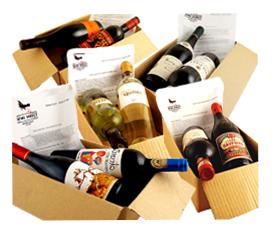 Join our monthly Red Wine Club or White Wine Club and receive two tasty bottles of wine delivered to your door each month. We select wines from the great wine regions of the world. Usually from small, high-quality, artisan producers making what we call Real Wines, not mock labels pumped out by big wine factories. Your credit card is automatically deducted $39.90 each month through our secure payment system. You can log in to your account anytime to change, suspend or cancel your subscription. It's all backed by our No Strings Guarantee so there's no risk. Give it a try! Take a tour of the world’s great winemaking regions and discover the incredible variety and interest that exists in wines from parts of the world you might not have experienced before. Automatic delivery each and every month to your home or office. You don’t have to lift a finger and it’s all included in your subscription. Super convenient. The all-up price of just $39.90 includes your two different bottles of wine, packaging, insurance, delivery and tasting notes, the lot. Plus discounted pricing on featured wines. Tasting notes and background information on the relevant producers and regions accompany each month’s instalment of the Wine Club. You’ll be a wine expert in no time!